Too many of today’s students’ needs are not being met by their college or university’s student services. 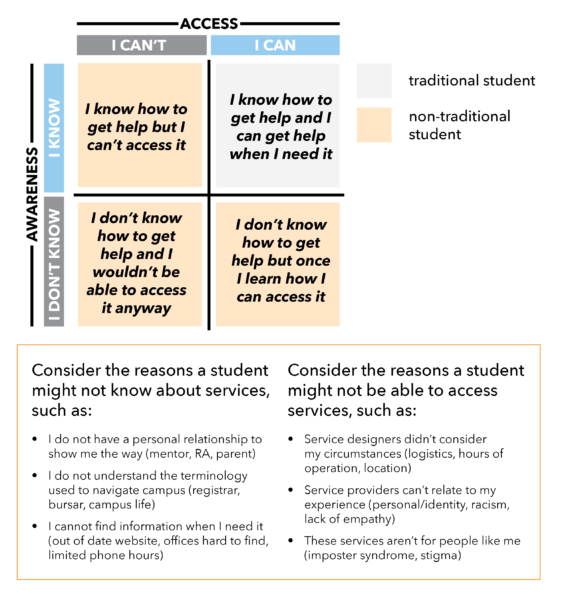 Institutions assume that students know what support is available to them and can access the resources they need. For many students who come from backgrounds that have been historically underrepresented or excluded from campuses, this is simply not the case. Design is rarely (if ever) neutral, and the historical precedents set by institutions of higher education are anything but. Designing student services with an inherent understanding of bias is critical, and reimagining services for our most vulnerable students will improve access and equity for all. At the beginning of the 20th Century, very few people pursued higher education and those who did were predominantly white men. By the end of the 20th Century higher education was made much more accessible to a much larger number of people. The GI Bill first extended educational opportunities to veterans, then a growing middle class sought out higher education as a pathway to social and economic mobility, and eventually fights for equality expanded federal funding (portable Pell Grants) for previously underrepresented groups to attend college.1 As a result, campuses began to see a diversification of their student body – from different races, genders, classes, and cultural backgrounds. As the latter half of the 20th Century progressed and more students moved away from home and lived on campus, student services expanded to ensure young adults were being holistically supported. These services include financial aid, career development services, academic advising, and more. However, at the time those student services were being established, the student body was still predominantly male and white (in fact, the predecessors to these specialized roles were often simply called “Deans of Men”).2 Today’s student body is significantly more diverse than it was a half-century ago. Student services were designed for one type of student; the type that attended four-year colleges 30 – 50 years ago. As student bodies have changed, student services have failed to adequately adapt to the needs of a diversified student body. On many campuses, the solution has been to add a specialized “Center” for this or “Office” of that, and unfortunately while well-intentioned, this makes the complex landscape of services even more difficult for students to navigate. These historically underrepresented students are graduating at lower and slower rates than their peers.10 While access to college has been expanded, access to the support needed to complete college is still focused on those students who already understand what’s available, whose needs align with those of historical students, and who feel entitled to ask for help from peers and professionals alike. After years of designing student services for a traditional student who is both aware of services and able to access them, colleges and universities need to change how we think to design for the 21st Century student. These two questions of awareness and ability are useful ways to enrich the approach. Consider the following matrix that explores student engagement with support services. These reasons are all more likely to affect historically underrepresented student groups. As student populations diversify, there can be fewer opportunities for informal networks to provide advice for navigating college. For example, parents of first-generation students cannot simply draw from their own memories, part-time and commuter students don’t have access to residential advisors, and online students lack face time with their classmates and are less likely to be involved in clubs. Service providers already typically meet the needs of students in the top right box. Students in this box likely fit the traditional student mold; they attend college as part of a family legacy of college goers, with fewer barriers, deeper informal networks, and safety nets that they could tap when they didn’t know what to do. However, the vast number of students who now fill colleges and universities often fall into the other three categories and either don’t know what services are available to them, don’t feel entitled or able to access them, or both. As you think about designing outside of the “traditional student” box on the matrix, consider how designing for non-traditional students can improve the experiences of all, because good design does exactly that. The quintessential example of this design principle can be seen in the wheelchair ramp from the curb to the road. While these are put in place primarily to allow people in wheelchairs to cross the road, they benefit everyone: mothers with strollers, people walking their bike, pushing shopping carts, and wheeling luggage.11 When we apply the same thought process to how we approach service delivery, we must broaden our definition of ability to include social and systemic barriers to accessing services like the ones outlined in the two-by-two above. Consider the following scenarios: Sarah may need to register for classes and receive advisement over email after putting her kids to sleep, but these expanded service hours mean that George can also interface with his advisor while he’s studying abroad in Japan, and Aparna can go to her professor’s office hours instead of waiting in line at student accounts to pay her fee. Service providers are employing technology to allow students to complete transactions online at any hour, using chat as an additional channel for getting help, and increasing visibility and face time with students by offering pop-up service stations at the place and time of need. With the help of new technologies and networks that expand the possibilities of what can be done (as well as when and how), many universities are already making progress creating more opportunities that are critical for the needs of the few, but beneficial for the student population as a whole. Student populations will continue to change, and universities must respond with empathy and innovation. By taking a user-centric, inclusive approach to designing the student experience, they can not only continue to meet the needs of a diversifying student body, but exceed the expectations of traditional students and improve outcomes for all.